Following on from the launch of the LGBTI+ National Youth Strategy 2018-2020 in June 2018, Dr Katherine Zappone, TD and Minister for Children and Youth Affairs, is happy to announce the launch of this competition to design an LGBTI+ public recognition marker for display in sports clubs, cultural bodies, arts organisations, youth groups, businesses and more so they can declare their support for diversity and the inclusion of LGBTI+ people. The Minister is calling on young people up to the age of 24 years to get creative and submit an original design to be considered for use on the public recognition marker. The mission of the LGBTI+ National Youth Strategy is to ensure that all LGBTI+ young people are visible, valued and included so designs should take this as their inspiration. The submissions will be assessed by a selection committee and the winning design will be widely displayed in organisations and services throughout Ireland. A prize will also be awarded to the winner by Minister Zappone and honorary mentions will be given to other designs in select categories. To achieve the mission of the LGBTI+ National Youth Strategy, a number of goals, objectives and actions have been outlined to ensure that a cross-governmental approach is undertaken to put additional measures in place to further enhance the lives of LGBTI+ young people. The design of a public recognition marker is one of the actions under Goal 1 of the Strategy, which is to "Create a safe, supportive and inclusive environment for LGBTI+ young people". The realisation of this Goal will see the continued improvement of safe, supportive and inclusive spaces for LGBTI+ young people in all walks of life so that they feel widely supported and have the confidence to be themselves and actively participate in all aspects of society without fear of harassment and discrimination. 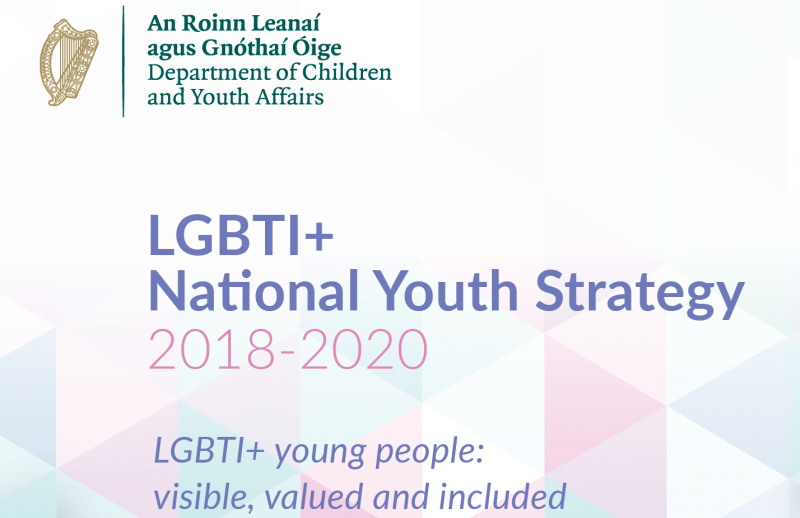 The LGBTI+ National Youth Strategy was published on 29th June 2018 and is a world first. It is a key commitment for DCYA as part of the 2016 Programme for Partnership Government and will make a significant contribution towards the Government's broader commitment to continue to strive for the full inclusion of LGBTI+ people in Irish society. It is a three year Strategy that is strongly action oriented with the mission to ensure all LGBTI+ young people are visible, valued and included.